Look what we found in the city today! An honest-to-goodness phone booth with working door at the corner of West End Avenue and 101st Street. Vespa on the street is an added bonus. 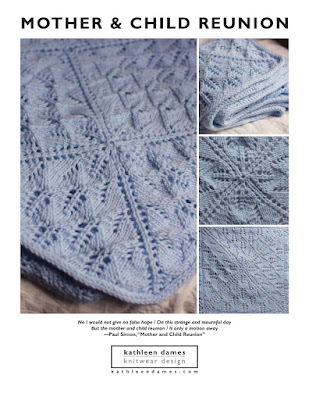 Can you believe 2025 knitters on Ravelry have worked this pattern? Amazing. It is a lovely little shawl. I like the increases on both sides, which make it wider and shallower than most triangle shawls (and may use that trick in a future design). And the yarn is scrumptious, and I like the semi-solidity of this colorway. I can't wait for some cooler weather to really put this knit into rotation. I'm sure there are more, but that should get us started. I'm hungry! Off to pick up Isobel from soccer and get some yummy empanadas from the cart. New York street food is pretty good, too. I may have lost a day (or five) to this Project search. I *know* that Ravelry is filled with tons of creative knitters and crocheters, but the amount of original stuff is pretty amazing. I have four almost-FOs to share, but the BSJ needs its buttons, the (original design) sweater is rolling at the bottom hem and *something* must be done about it before sharing, the socks need to be picot-ed (right now they have a ribbed top, which is bleah), and Dad's belated Father's Day present needs it's ends woven in and some thought given to its photo. So, I'm about to start the charts on Ishbel. I love the Malabrigo Lace (now called Baby Lace, apparently) and hope to squeak a large one out of this skein as other Ravelers have done. Go check out that eye candy, and if you're not a Raveler yet, what are you waiting for? Apparently, sign-ups are being processed on the same day now, so no waiting. Yes, it's Wednesday morning, which means it's time for me to (maybe) get around to 10 on Tuesday. This week: Ten Guilty Pleasures on TV.